Ideally located in the heart of Mai Chau valley, Sol Bungalows is the most exquisite and tranquil place in the area, surrounded by lush rice paddies, emerald mountains and bamboo gardens. Sol Bungalows is truly a little paradise. This secluded resort offers valley view with rice fields in front and mountain ranges in the distance. Each bungalow is a guestroom which is inspired by White Thai culture, all decorated with contemporary touches of Thai brocade and handicraft that give each living space a soothing Thai ambiance. Sol Bungalows has a wide range of facilities and services to suit both the laid-back guests and the more active ones. You can join cooking class, weaving class, traditional dancing class or get pampered with some massage treatments or relax with some drinks and enjoy the peace and beautiful views. For the more fit and adventurous, there are mountain bikes and a list of exciting outdoor activities. The bungalows are built with brick, stone, terracotta tiles and roof tiles. All are equipped with Western style bedding, en-suite bathrooms with hot and cold shower, hair dryer, air conditioner, fan, LCD TV, DVD player, telephone, mini bar as well as tea and coffee making facilities. Besides, Sol Bungalow has A La Carte menu and Vegetarian menu with various dishes for your selection. Sol Bungalows Hotel also offers a variety of facilities and services suitable for travelers who choose to stay here. You can join a cooking class, a textile class, a traditional dance or massage class under the guidances of skilled massage professionals. Or even more adventurous, you can ride with friends, relatives and mountain bikers and participate in many other exciting outdoor activities. Start the day with a healthy breakfast, swim in the pool, then walk out of the hotel to explore Mai Chau. You can completely move on your own or use available Sol Sol tours! Rest assured because although Hanoi is as hot as hell, you can still feel cool at Sol Bungalows, Mai Chau - to spend the night enjoying the feeling of laying on a thick mattress curled up in a soft velvet blanket and hear the wind blowing in the air. Room rates: $ 57 - 94. 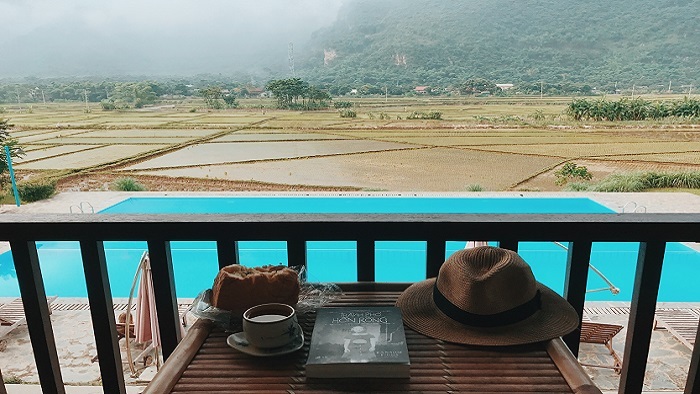 Located in Cha Lang valley, Mai Chau hotel is hidden under the misty mist of the northwestern mountains. The hotel offers many services for your travel such as visiting caves, waterfalls, Lac village, and many activities according to the needs of tourists such as reaping rice, fishing, learning to cook, etc. In addition, coming to Mai Chau villas, you also enjoy great relaxation services such as swimming pools, restaurants, cafes, cycling, etc. Room rate 40 - 43 $. 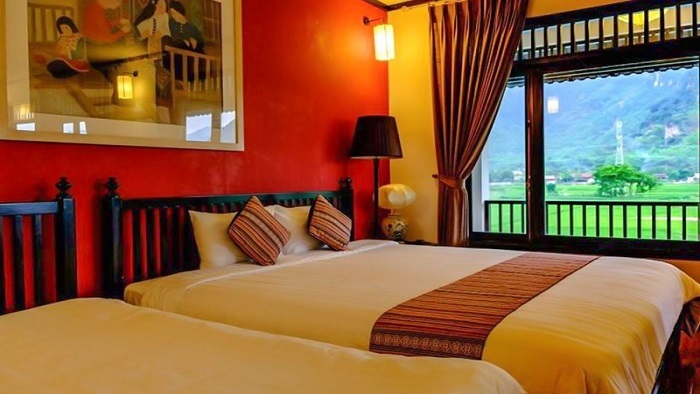 Mai Chau Lodge is a famous hotel in Mai Chau with excellent service, beautiful view, convenient location. The hotel offers services such as swimming pool, massage, hot tub, airport shuttle, bicycle rental, etc. Room rates: $ 29 - 39. Located in a convenient location for moving and visiting, the hotel is cool with beautiful view. In addition, there are many other services such as bicycle rental, restaurants, cafes. Room rates from 5 - 15 $. The homestay is located in a beautiful location, convenient for traveling. The homestay provides services such as bicycle rental, karaoke room, mountain climbing, cafes. 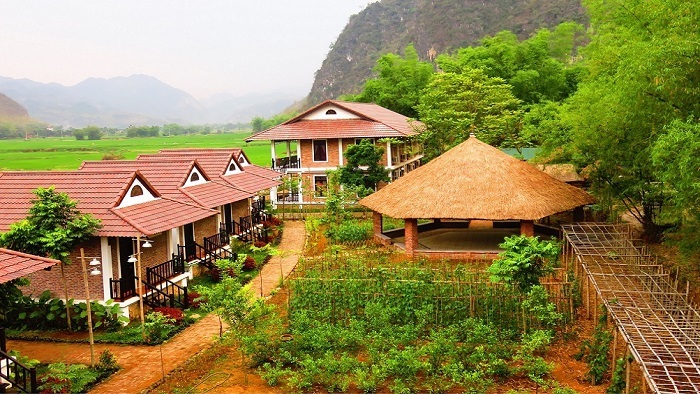 If you are making plan for Mai Chau valley break tours, Sol Bungalow is one of the ideal place to stop. Mai Chau Trek hope the above information will be useful to you.